Fewer September 11 Memorials: Why? Spoken by former New York Governor Pataki, at Ground Zero on the fifth anniversary of the September 11 attacks, these eloquent words should serve as a mandate to all Americans. Consider: This past September 11, there was the annual reading of the names at the former site of the twin towers, and remembrances in the Pentagon, and in Shanksville. But nationwide, it seems that the memorials are dwindling. Sure, news outlets carried a sprinkling of 9/11 memorial coverage, a remembrance here, a ceremony there. In Boston, Arch Street Church displayed a long banner listing the names of those murdered on September 11. Inside, someone read the names of the dead to a very small crowd. But to my knowledge, there was no ceremony here in Foxboro, or even locally. That seemed to be the trend nationwide, judging by what I saw on the net that day. In past years, we tuned in and watched, or gathered. We talked about 9/11. We remembered. These days, not so much. Why? Why, for so many people, was Friday, September 11, 2009 just another day? Or a day where we realized the date and quickly put it out of our heads? Perhaps the reason is that for so many, September 11, 2001 is no longer just about the four planes hijacked and the panic and confusion and death on that sunny Tuesday eight years ago. This generation’s Pearl Harbor evolved (or mutated) into a miasma of issues and confusion — 9/11 has become a political football, wars in two countries, airport security restrictions, rolling back of civil liberties, profiling, rendition, wiretapping, debates on what constitutes “torture,” freedom versus safety, conspiracy theory, immigration debates, and far more. It’s also about how economically, our country never quite recovered since that day. Maybe too many people think “9/11” and get angry about Iraq, or Afghanistan, (or those who have died in those countries, and continue to fight for us). Maybe they think “9/11” and it spurs racial or religious fury, or maybe people get angry at what has happened since to our civil liberties and laws in the name of security. Maybe they think of any of a thousand different social, economic, government and national problems that resulted from the attacks that haunt us to today. Even at Ground Zero, the owner of the WTC site, insurance companies, the city and state government and the Port Authority and countless others battle over reconstruction plans, memorials, and other details. The effects of 9/11 are endless; after all, what aspect of our society was NOT affected by the attacks? ALL of these issues and topics, born in the 9/11 hellfire of New York, Pennsylvania and Washington, are REAL. All of them need to be debated, discussed, and acted upon. But each of them, paradoxically, detracts from the EVENT of September 11, 2001 itself. And perhaps that’s the problem. Each year, on September 11, we should, even briefly, put aside those important topics for a moment. We need to remind ourselves that this nation was attacked in an unprecedented, catastrophic fashion and 3000 people were murdered. 10,000 children were orphaned. Our nation, our way of life, was thrown into chaos. We were numb. As a nation we were wounded. In many ways we still are. As a nation we suffered a collective trauma, we grieved, and now we want to move on. But how can we heal, and truly “move on,” and deal with these other important issues we face, when it seems so many Americans want to “put it all behind us,” and worse, to FORGET 9/11? We MUST NOT forget. Remember that week in 2001? We united. On the steps of the capital, the assembled Congress sang, “God Bless America.” People waved flags from cars and buildings, and talked to each other. They cried together. Helped each other. Mourned the dead. Celebrated the sacrifices of the heroes. Promised to rebuild, both physically and metaphorically. Our national pride was never stronger. Each September 11, we should only remember what happened to this nation that day: The murdered, the orphaned, and the attack on who and what we are. We mourn THAT. We remember THEM. 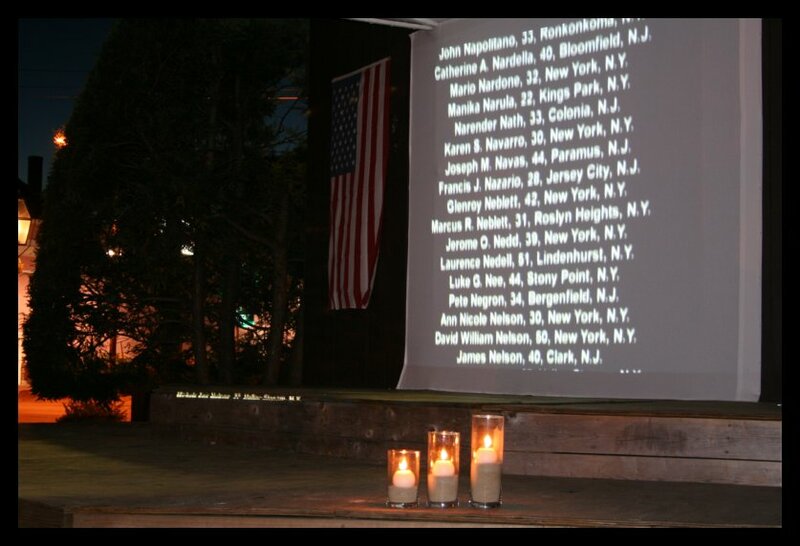 Wouldn’t it be marvelous if communities continued to hold candle ligh t vigils EVERY 9/11? Or if the flags flew everywhere on that day? What if we all took a few minutes on that day and gathered to pause and remember? We all lost something that day, and we should remember. And for the sake of the living, for all of us here at home, for those still fighting a war against terror at this moment, for the sake of our national identity, we need to stop and remember. Not just in Washington and New York. Everywhere in America.